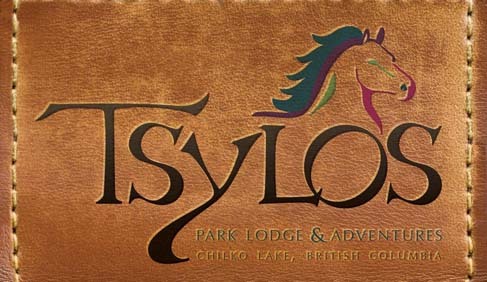 Download the Tsylos Park Lodge Brochure! 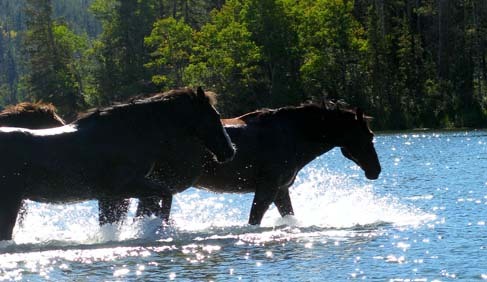 Experience one of North America’s most beautiful destinations on a horseback riding vacation or a wilderness pack trip. Tsylos Park lodge – Easy to Get to Far from the Crowds. Tsylos Park Lodge is located at Chilko Lake, 180 air miles north of Vancouver, BC is one of the most beautiful and pristine areas in North America. Wild, remote, and fairly isolated, it is seldom visited and largely untouched. 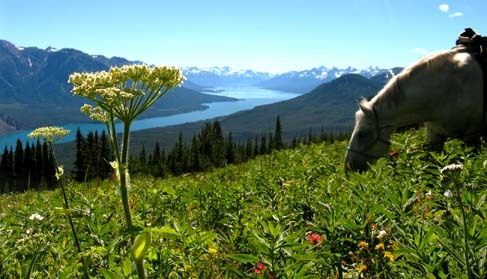 Chilko is like a rare gem, few people have discovered it, but once discovered, it is rarely forgotten. There are few places in the world as beautiful to explore. • Restore, Relax, and Connect. At Tsylos you enjoy a rare opportunity to enjoy your private time and your vacation. Tsylos is a place to reawaken your spirit and rediscover life’s simple joys. Since no cell phone or Internet is available (except for emergencies) true connections are made. • Amazing people. 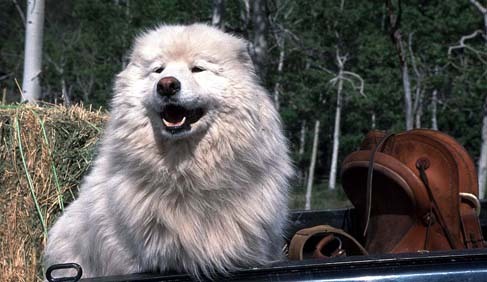 At Tsylos our guest join us from around the globe, but all have a few things in common. The love of Adventure, a passion for horses, and the thrill of discovering extraordinary places. From friends, couples, families, to single travelers, at Tsylos old bonds are restored and new ones are born. The number of guests is small and the environment is intimate and inclusive, even if you’re a single traveler. • McLean Family owned since 1957. The absolute breath taking surroundings that we call home and the intimate ambience of our lodge make this a very special place. We invite you to join us. Pack your bags, slow down your watches, and come & enjoy a Tsylos experience. Download our free brochure for full-color photos and package details! 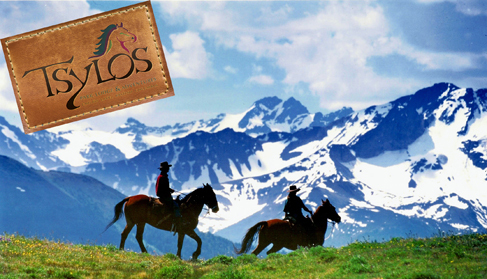 Tsylos offers you a variety of 7-Day riding vacations to choose ride. Pick Your Next Adventure! 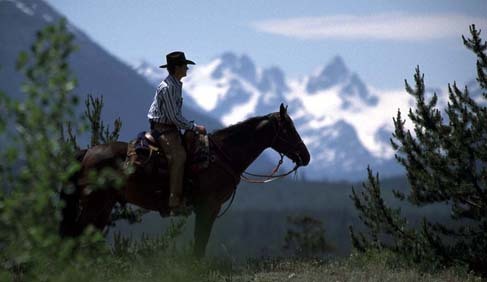 Horseback Riding Trips from the lodge: Designed for intermediate to advanced riders. 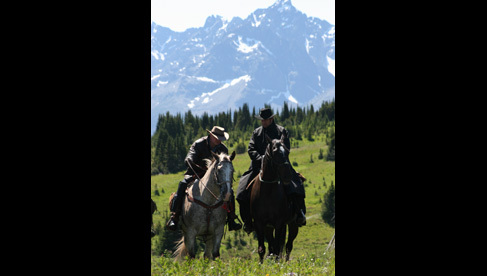 Daily riding adventures take you on a breathtaking tour of the region's trails, from the rolling hills of the Chilcotin plateau, to tree riding (you will love it) to the stunning vistas of the coastal mountain peaks. It’s fun, exciting, and beautiful! Return at the end of the day to the creature comforts of the lodge. 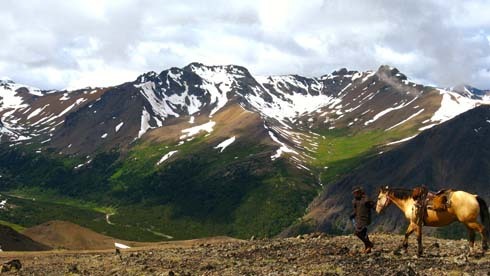 One Week Wilderness Horse Pack Trips: Horses hold deep roots in the Chilcotin heritage and are still very much in use to reach the back country. Since 1957 the McLean’s have upheld this noble tradition of horse travel to deliver you to a place where nature is still wild and free to awaken the adventurer in you. 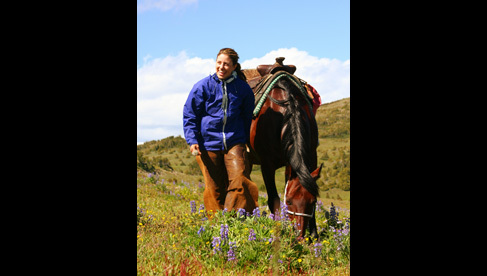 Your horse takes you on a unique experience through beautiful rugged glaciers, mountain meadows, crystal clear lakes and streams, blankets of lush colored wild flowers, and roaming wildlife. We Take care of the details—So you don’t have too! 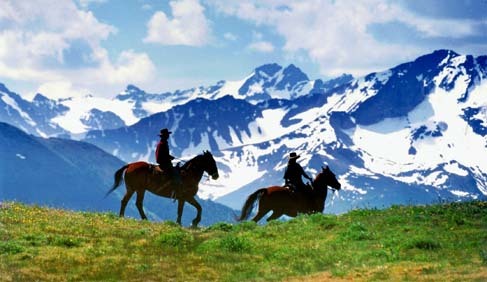 Pick a horseback riding package, choose a date, and tell us how many people are coming with you. Then, leave the rest to us. Our trips mean you don’t need to worry about a thing except packing a bag, clearing your calendar, and getting to Vancouver. • Accommodations that are quiet, comfy, and offer you to sleep like a rock. • Tasty meals prepared by our Chef that are healthy, tasty, and serve family style. • Want a day off from riding, canoes, kayaks, hiking trails or the luxury of reading a book. 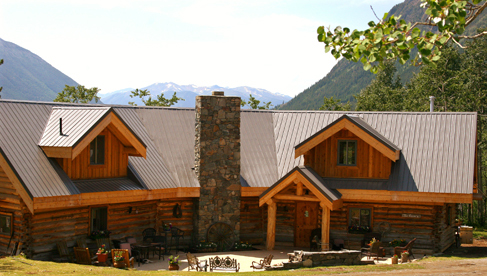 The beautiful, handcrafted log lodge overlooks the Chilko Valley and river. It is the perfect gathering place for connecting with friends and other riders. It features rustic log beams, a big stone fireplace, over-stuffed furniture, fully stocked bar, and Jacuzzi, and expansive wraparound decks. 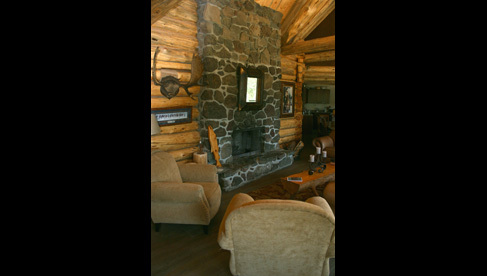 After a long and exhilarating day of riding, you’ll love coming back to the lodge to sit down beside the warm crackling fireplace and share stories about the day. • Wrap around deck with comfortable chairs and fuzzy blankets for viewing a million stars. Meals are prepared fresh by our chef in our open kitchen, and served family-style in our dining room. Each day, everyone sits down together to share a tasty breakfast and dinner. Great conversation and lots of laughter are always on the menu! Lunch is spent streamside, on top of a mountain, or wherever your wanderings have taken you! 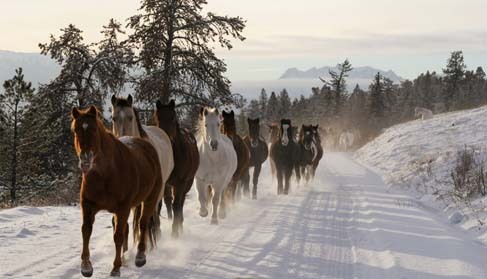 If your travel partner isn’t keen on horses, fear not. At Tsylos Lodge, there is no shortage of things to do! In addition to horseback riding, canoeing, kayaking, and hiking, we offer an excellent variety of packages to suit your mate’s passions while you’re out riding the trails. The only hard part about Tsylos is going home. Want to learn more? Download our brochure for package details and photos! Chilko Lake, BC, Canada or Tsylos Provincial Park is located 180 air miles north of Vancouver, British Columbia, Canada. 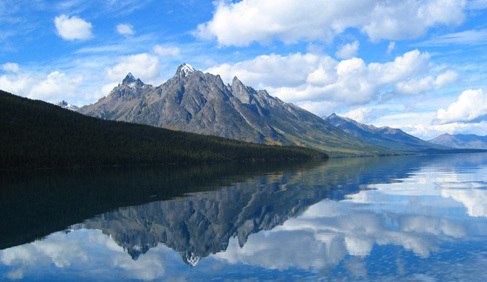 Chilko Lake is 50 miles long, pristine wilderness and surrounded by snow capped peaks and rugged glaciers. 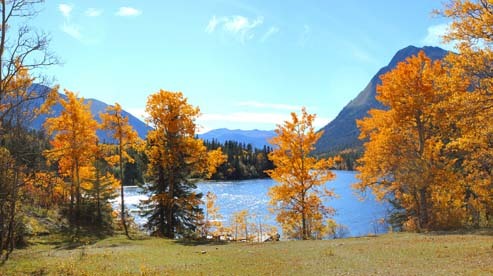 At the north end of Chilko lake is the dividing point between the Chilcotin Plateau and the Coast Mountains, where the Chilko River flows north easterly. 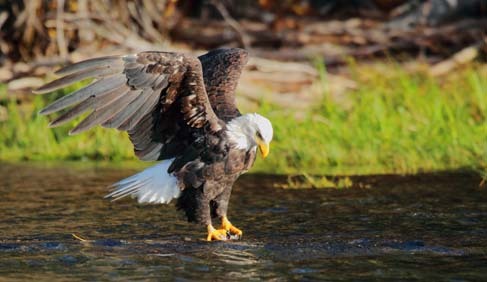 Our lodge is located on the banks of the Chilko River and the dividing point between the Coast Mountains the rolling grasslands of the Chilcotin Plateau, offering excellent riding, outstanding fly fishing, and a photographers paradise. 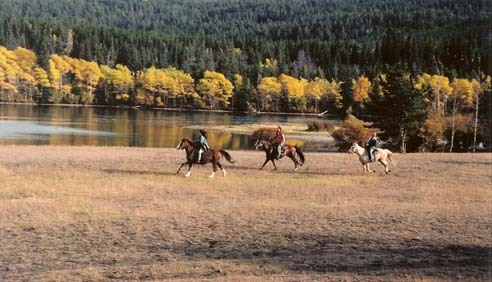 Western intermediate to advanced, although novice riders can join on the Horse Pack Trips providing they are physically fit and keen. 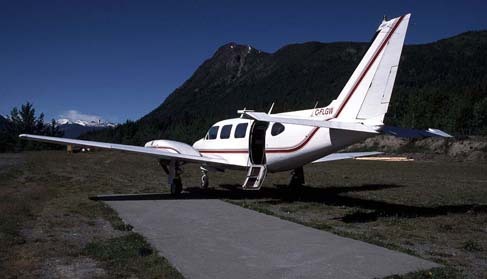 7 Night packages from Vancouver, BC including round trip charter flight. Easy to connect to but far from the crowds! From $2195 USD to $4395 USD per person based on double occupancy depending on the package chosen.